TORONTO - It ain't over until it's over. And for teams who lose their opening-round series in this season's UUHA Playoffs, the dream of hoisting the UUHA Championship Cup won't necessarily be dashed until after the Quarter Finals, if at all. In a departure from previous year's post-season formulas, the 2018 UUHA Playoff format will see teams that lose their opening round series afforded a second opportunity to make the Finals, providing they win all of their remaining games - including a St. Patrick's Day double-header at Upper Canada College. 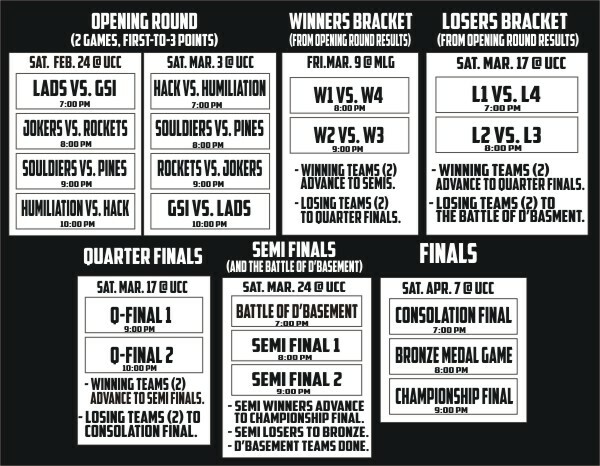 Opening-round winners, meanwhile, will take each other on at Maple Leaf Gardens on Friday, March 9 with the two victors advancing directly to the Semi Finals two weeks later. Their vanquished counterparts will prove themselves worthy of a Semis berths in a pair of Quarter Final games on Saturday, March 17th. The whole shebang wraps up on Saturday, April 7 at UCC with the Consolation Final, the Bronze Medal Game and, capping off the evening - and the season - the Championship Final at 9:00 pm. If any of that sounds confusing, check out the graphic below for clarification.